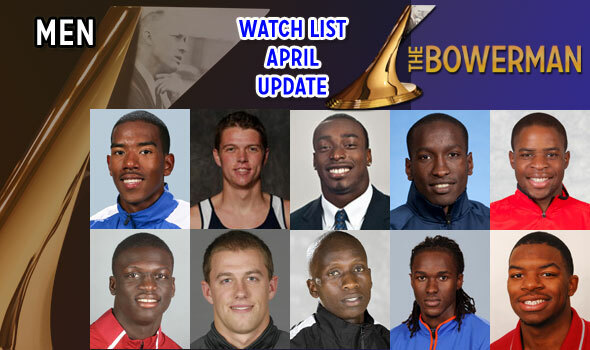 NEW ORLEANS – The Bowerman Men’s Watch Committee in conjunction with the U.S. Track & Field and Cross Country Coaches Association (USTFCCCA) announced on Wednesday their fourth update of the men’s watch list for collegiate track & field’s biggest award – The Bowerman. This update places BYU’s Miles Batty and Texas Tech’s Omo Osaghae on the watch list’s group of ten. Batty was named the USTFCCCA’s National Track Athlete of the Year during the indoor season and Osaghae ran a would-be world-leading hurdle time of 13.29 (w: 2.2) last weekend. In addition, added to the “also receiving mention” list for the first time this year is Cal Lutheran’s Eric Flores from Division III, Texas A&M’s Tabarie Henry, Virginia Tech’s Marcel Lomnicky, and Florida State’s Maurice Mitchell. Jeshua Anderson SR Washington State Hurdles Woodland Hills, Calif.
Will Claye JR Florida Jumps Phoenix, Ariz.
Jeff Demps SO/JR Florida Sprints Winter Garden, Fla.
Walter Henning SR LSU Throws Kings Park, N.Y.
Christian Taylor JR Florida Jumps Fayetteville, Ga. OUTDOOR: Anderson clocked a collegiate-leading time of 49.33 in the 400-meter hurdles to win the Jim Click Shootout last weekend. In addition, his wind-aided win of 13.86 in the 110-meter hurdles in the same meet ranks 12th on the national performer’s list so far this early outdoor season. INDOOR: His indoor season best in the 400-meter dash of 46.93 placed him in the collegiate top 35. The outdoor season is where Anderson is expected to shine when he can compete in his specialty event – the 400-meter hurdles. OUTDOOR: Has yet to compete. INDOOR: Batty, the USTFCCCA’s National Men’s Track Athlete of the Year, spurred BYU’s run to the podium for a third-place team finish at the NCAA Indoor Championships with national titles in the mile and as anchor of the squad’s DMR team. Batty was one of two to finish the national mile final in sub-four fashion as he topped Tulsa’s Chris O’Hare for the national crown with a 3:59.49 clocking. Batty, the day previous, led the Cougars to their first national crown in the DMR since 1978, holding off fast closing Indiana and Minnesota, with a 3:56.14, 1600-meter anchor split. The relay’s time of 9:29.28 is the seventh-best in collegiate history. Batty was the Mountain West Conference mile champion (4:15.23) and again was anchor of the BYU crew to a DMR conference title. Batty notched the fastest mile time of the collegiate season with a 3:55.79 run to win the Flotrack Husky Classic on Washington’s oversized track. OUTDOOR: Opened the season with a win in the 10,000 meters at the Raleigh Relays in a collegiate-leading time of 28:15.64. Currently leads all of Division I in the event by nearly 17 seconds. INDOOR: At the NCAA Indoor Championships, Chelanga placed runner-up in the 5000 meters to Iona’s Leonard Korir with a 13:27.34 clocking. Chelanga, finished 15th overall at the NCAA meet in the 3000. In his first 5k of the indoor season, Chelanga recorded a then world-leading time of 13:41.35 on his home 200-meter, flat track on January 29. Chelanga notched a would-be collegiate leader of 7:48.24 in the 3000 meters at the New Balance Indoor Grand Prix where he finished fourth in a professional-loaded field. In addition, Chelanga tallied a 7:50.92 clocking at 3000 meters in placing fifth overall at the Flotrack Husky Classic. Chelanga added to his tally of Big South Championships with a mile crown (4:16.88) this season. OUTDOOR: Opened the season with a seventh-place showing in the long jump at the Florida Relays. INDOOR: At the NCAA indoor meet, Claye left his best for the last attempt in the triple jump. After five rounds, Claye had the lead at 55-8¼ (16.967m), but teammate and defending champ Christian Taylor staked his claim for the crown on his final attempt with a jump of 55-9 (16.99m). Claye responded with the event’s final salvo with a mark of 56-10 (17.32m) to win the national crown, set a new personal best, land as the all-time fourth-best collegiate performer in the event, and reset the NCAA meet record by a centimeter. Adding to the national triple jump crown, Claye finished second in the long jump at the NCAA meet with a personal best of 26-4½ (8.04). Claye landed a mark of 56-4 (17.17m) achieved in finishing runner up to teammate Christian Taylor at the SEC Championships. Claye added a third-place showing in the long jump at the SEC meet, placing behind only Arkansas’ Tarik Batchelor and LSU’s Zedric Thomas – both members of the national top five of the event this year. OUTDOOR: Demps opened the outdoor campaign by capturing the 100-meter title at the Florida Relays in a slightly wind-aided time of 10.07 (w: 2.2). The time leads the NCAA-qualifying list and is an all-conditions world-leading time. Demps also helped the Gators to a third-place overall showing in the 4×100 at the Florida Relays (38.91). INDOOR: Demps claimed his second-straight NCAA indoor 60-meter title with a personal-best run in the finals of 6.53 seconds. Demps is the first back-to-back NCAA indoor short-sprint champ since DaBryan Blanton of Oklahoma in 2004 and 2005. After opening the season with a 6.57 in winning the Virginia Tech Elite, Demps has four times more clocked sub-6.60 in the 60 meters, including when he won the SEC title in the event for the second-straight year with a 6.55. OUTDOOR: By no surprise, Henning opened the season with a win in the hammer throw at the LSU Invitational. While he’s seen better days in the mark-department, his throw of 216-9 (66.08m) delivered him a seventh-straight victory in the event and 18th overall against collegians covering all weight events. INDOOR: Henning did not miss in the weight throw the past two years. The LSU strongman has won 11-straight against collegiate competition with the 35-lb. weight – five of which has come from 2011 season, which included his third-straight SEC crown and second-straight NCAA crown. Henning had little trouble defending his title with a meet-best of 72-8½ (22.16m), nearly three feet better than the competition. At the LSU Twilight on Feb. 18, Henning notched his season’s best throw of 76-6¼ (23.32m). Henning’s personal best in the event is 78-1 (23.80m). OUTDOOR: Yet to run an open event. Ran second leg on team’s 4×400 squad that finished second at the Alabama Relays (3:15.35). INDOOR: Prior to the NCAA Indoor Championships, on every occasion in which he has stepped on the track for the 400 meters during the 2011 indoor season, Kirani James set a new world leader. Starting on Feb. 12 when he ran 45.47 (oversized) to win Notre Dame Meyo Invitational, then on Feb. 26 for the preliminary round of the SEC Championships when he ran 45.37. And, for the trifecta, James, who is only 18, clocked 44.80 in the SEC final to not only set another world record, but it also set a new world junior all-time best. The time places him in the top five of the all-time world indoor list and only Kerron Clement’s (Florida)world record of 44.57 set in 2005 stands as a better all-time collegiate mark. At the NCAA meet, James tripped and fell shortly after completing the first lap of the qualifying round and did not finish the race. INDOOR: Korir won the NCAA indoor 5000-meter title in a meet-record time of 13:26.01, breaking the previous mark set by Alistair Cragg of Arkansas in 2003 (13:28.93). The junior clocked 57.69 in the final 400 meters to take the crown, record the best collegiate time of the season in 2011, and notch the sixth-fastest time (facility legal) in collegiate history. In addition, Korir took sixth at the NCAA meet in the 3000 meters. Korir was named the MAAC’s Most Outstanding Performer on Feb. 18 after finishing first in the mile and anchoring the distance medley relay quartet to a championship at the conference meet. OUTDOOR: Osaghae has started off his senior season with his best marks of his career. In his first race at the TCU Invitational he ran a then NCAA-best 13.49 and broke the Texas Tech school record. Two weeks later the senior put on a show for the home crowd at the Texas Tech Open. Osaghae ran a wind-aided, 13.29 (converted to 13.33 for altitude) to win his third-straight race of the season. He now leads the NCAA qualifiers with his converted mark and has yet to lose a race this season. INDOOR: With no indoor eligibility remaining, Osaghae competed unattached through the indoor season. Osaghae managed a breakthrough in the 60-meter hurdles as he won the USATF Indoor title in the event at altitude in 7.52. OUTDOOR: Taylor added to his resume as quarter-miler in opening the season with a win at the Florida Relays in the 400 meters. His time of 45.46 ranks third in the NCAA this season and in the top five in the world. INDOOR: Taylor sent quite a message in winning the SEC Championship triple jump on his final attempt. With a mark of 56-11½ (17.36m) that not only won the event for the third-straight time and set a new SEC record, he became the third all-time best collegian indoors in the event. Only Charlie Simpkins (Baptist, 17.50m, 57-5, 1986) and Mike Conley (Arkansas, 17.40m, 57-1, 1985) have jumped farther in indoor collegiate history than Taylor. The Gator also finished eighth at the SEC meet in the long jump and has a season’s best in the event of 25-0 (7.62m), good for the national top 25. Taylor placed second at the NCAA meet to teammate Claye with a last-round best of 55-9 (16.99m). The Bowerman Advisory Board appointed four of its members to comprise The Bowerman Men’s Watch Committee and another four of its members to make up The Bowerman Women’s Watch Committee. The committee will release their next men’s update on Wednesday, May 4. The three men and three women finalists will be named late June. Robby Andrews SO Virginia Distance Englishtown, N.J.
Andy Bayer RS SO Indiana Distance Leo, Ind. Charles Clark SR (out) Florida State Sprints Virginia Beach, Va.
German Fernandez JR/SO Oklahoma State Distance Riverbank, Calif.
Mason Finley SO Kansas Throws Salida, Colo.
Eric Flores (N) SR Cal Lutheran Throws Custer, S.D. Torrin Lawrence JR Georgia Sprints Jacksonville, Fla.
Maurice Mitchell (N) JR Florida State Sprints Kansas City, Mo. Mookie Salaam JR Oklahoma Sprints Edmond, Okla.
Dorian Ulrey SR Arkansas Distance Port Byron, Ill.
Craig Van Leeuwen JR Ramapo Pole Vault Little River Falls, N.J.